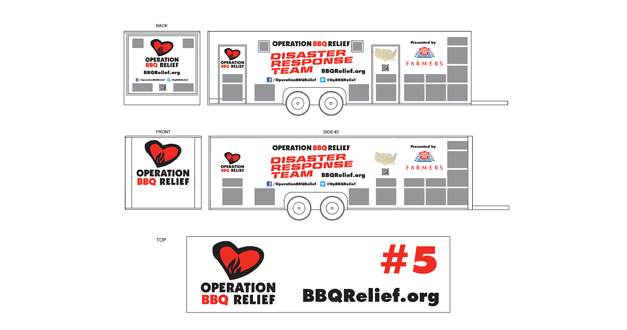 Operation BBQ Relief was established in 2011 after the devastating tornado in Joplin, which is south of Kansas City—one of the nation’s major barbecue capitals. BBQ pit masters (that normally fire up their equipment for competitions) are experts at cooking outside in any condition and serving large quantities of food at events. By firing up the grills to help, Operation BBQ Relief was born and volunteers began cooking BBQ and serving hot meals to the storm’s victims as well as the hundreds of emergency workers and volunteers who were on scene to help. Utilizing these pitmasters and a network of volunteers, Operation BBQ Relief provides hot meals to people affected by disasters across the United States. Through its expertise in cooking and catering barbecue meals—and thanks to generous donors and sponsors—the not-for-profit is able to mobilize quickly to any area in need. The organization was created after the devastating tornado in Joplin, Mo. Last year it served more than 100,000 hot meals in New York and New Jersey in the aftermath of Superstorm Sandy. Local coverage in Kansas City after the disaster response team returns home from working in Moore, Oklahoma.